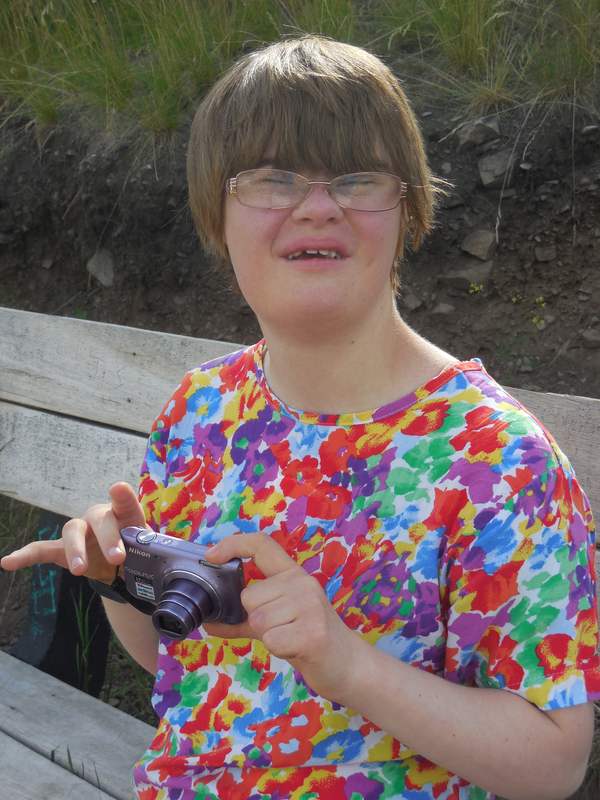 I entered the Art Contest for young people with disabilities at the last minute. It was crazy doing the Made Fair and getting everything done for that contest but we did it! The theme was `The Journey.’ The essay is too long but I copy parts of it for you to read. Along with photos of the pieces I submitted. Enjoy! 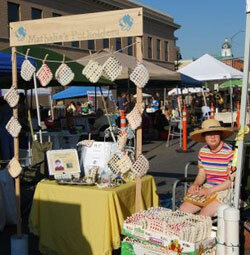 I wrote about how I `journeyed’ into the pot holder business; how my Mom put her hands on mine and made the pot holder at the beginning; and how gifts for teachers moved into actually selling them around town. My tandem bicycle was my first major purchase. The tandem has opened up `The Journey’ experience to us. Some `journeys’ are simple as riding to the library or the post office; others are opportunities to exercise and get out of the city to enjoy the natural beauty around Missoula. I `journeyed’ into the fiber arts for my Senior Project. I took a weaving class at Montana Association of Weavers and Spinners Conference. At the Conference I bought a kit for Australian Locker-hooking. My `Trinitarian Triangles’ piece demonstrates my `journey’ into joy. I went to the Conference intending to learn to weave. Unexpectedly I tried something new suggested by a vendor who took an interest in my endeavors. My Mom read the directions and helped me. Already I have made many trivets and the small wall hanging I submitted for this contest. This past year—my first year out of high school—has been `journey’ of discovery. I discovered that I respond unfavorably to many foods. This has led to `journeys’ into new recipes and ways of eating. I am also learning how to monitor my own physical and mental well-being by journaling. Keeping a journal is a way of tracking the `journey’ in thought and action. I love it. It helps me feel confident and competent as I `navigate’ into the unknowns of adult life. I also began to explore photography with the camera my parents gave me. 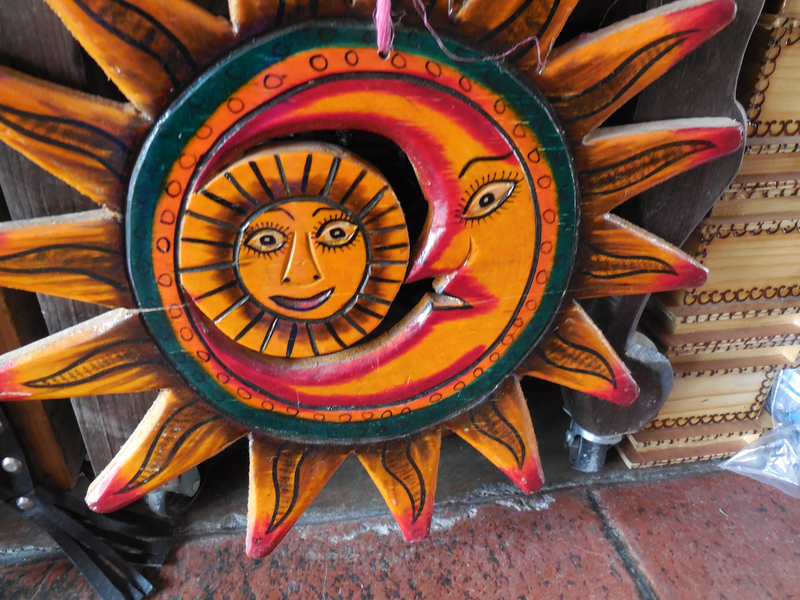 The photo I entered was taken in Antigua, Guatemala: Sun and Moon. The cycle of work and rest; activity and refreshment; childhood and adulthood. I love to photograph all of my `journeys’ from the exotic to the everyday: XinJiang, China to dinner in the oven . My Mom was a bundle of worries this year as I transitioned into my `adult life.’ Yes, I was slow and uncertain and maybe a little sad to have high school be all done. She was worried. But I would like to tell her that it is a `journey.’ I am learning what it means to have so much free time and learn what I like to do with that time. I am on a `Journey’ and I am enjoying each step of the way. I entered a photo of the scarf I dyed using fiber reactive dyes and ice! The process was unique and rather messy. When the ice was all melted the scarf was brown and muddy looking. But . . . when we washed it and hung it to dry, it was beautiful. And so it is a metaphor for `The Journey:’ the journey may be messy, uncertain, confusing but we know the Guide and can walk with Him in confidence and joy. Thus my `Trinitarian Triangles’ piece shows that `Trust’ is part of `The Journey.’ My scarf sends me into `The Journey’ in style. My Mom and I drove to Great Falls for Montana Association of Weavers and Spinners Conference. We took a lot of stuff: my spinning wheel, fiber to spin, loopers to weave pot holders; all my Mom’s knitting projects and books ;). We checked in and I got my very cool tote bag full of fiber goodies: dyed fleece, felted pin-cushion braclet, a shuttle. I filled out forms so that I could show the things that I had made: my rug, looker-hooking trivet, and scarf my Mom crocheted from the yarn I had spun. We hung out for a while: watched a movie, wrote a blog post, ate dinner and then we went shopping. I took lots of pictures of all the very pretty wool and yarn. In one big basket of wool, there was a surprise: very big eyes in a very little puppy. Bags of . . .
Friday morning the hotel served a very fancy breakfast: gluten free bread, fruit and gluten-free bacon. I did not eat any of my gluten-free cereal or dairy free milk. The hotel breakfast filled me up! Friday’s class was a very fast dyeing class. The teacher explained everything and then everybody just did it. It is a good thing my Mom helped me because there was no way I would have been able to keep up without her. Even with her helping, I was usually the last one. It was okay. Together we competed four projects. First was ice-dyeing. I dyed a scarf, some yarn and baby socks. My Mom helped me wash and soak everything and place them on the tray and in the bucket. Then I put the ice on top. She found 5 dyes out and told me to pick two: blue and purple. With a mask on, I carefully scooped the dye and sprinkled it on top of the ice. I sprinkled purple and then blue. Then I put my tub on the floor. It had to wait for 24 hours. My classmates started the next project while we were just finishing up. My Mom was listening to directions AND watching me sprinkle at the same time. This time I chose yellow and orange. I painted the cloth and then I placed shapes like bird, house, flower, butterfly on top of the paint. A classmate found some sun shining through the ceiling windows for this project. The next project was a bag and for that we needed the sun too. This time I chose sunburst orange. My Mom helped me catch-up by finding stars and hearts for my shapes. By this time I was hungry and we were really far behind! My mom was so happy to hear that! I think the class wore her out. The last project was the best: easy and fun! 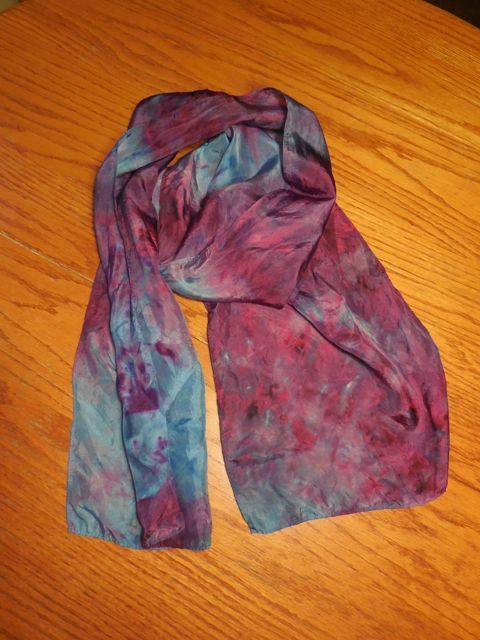 Just get the scarf wet, paint some dye on it, crumple up the plastic underneath and then wait for it to dry. My Christmasy Weekend started with the violin recital at the Mall on Friday. I wore Matthan’s red `Santan’ hat and a Christmas dress. Heidi’s and Beth’s students gathered at the clock for tuning. We played lots of Christmas songs: Silent Night, Away in the Manger, Joy to the World, The First Noel, Jingle Bells, and more. The Noodle Express for dinner was so cold because the take-out window kept opening and letting in gusts of cold wind into the kitchen. All the employees were wearing hats and gloves if they could. My mom paid for my food this time because I forgot my purse. I was more concerned about remembering my violin and Santa hat than about my money. Saturday we packed for the Big Sky Fiber Arts Guild meeting and Christmas Party: presents for the game, locker-hooking to work on keep my hands busy, rice and dessert for the potluck. I had so much fun seeing old friends and listening to their conversations that I did not get much locker-hooking done. My mom can listen and knit at the same time. I mostly do one thing at a time. Anyway, lunch was really good because I got to eat cow’s cheese and gluten foods like noodles and cookies. On Thursday Dr. Starbuck poked my finger and dropped my blood onto five little circles. In about two weeks I will find out what I can and cannot eat. In the meantime, I can eat anything I want to eat! The present game went around the circle until I had the choice between my present (pot holders) and a very big present bag. Duh! That was an easy choice: a Christmas goat! There was also some very pretty red wool and fun red yarn, labels to put in my handmade headbands and cowls, a book about natural dyeing, and a very nice basket to hold everything. My mom is excited about making me something very cute and very red. And I am excited about the Christmas goat. I named him Kanga!! I took a short power nap in the car and then after dinner we were off to the Symphony. The Nutcracker music was a little different but I liked it. During intermission I voted for Jingle Bells. I was disappointed because they did not play Jingle because White Christmas won the prize. Still I enjoyed White Christmas. At church on Sunday we had a mini-Christmas Concert by Dolce Canto and breakfast at the restaurant with Grandma and Grandpa. Another short power-nap and then off to the Writing Center Christmas Party! We played the present game again but this time the presents were not about fiber, wool and yarn, they were about `white elephant’ which means mischievous. I gave a `white rabbit’ and I got a elk call movie. Hah! It was very funny! I liked all the food and I liked seeing my Writing Center friends. I gave everyone a pot holder. `It’s wonderful to be home so early in the week, Mathalia; now we have time to get some work done.’ Work?! Well, okay BUT we are also going to relax and so we did! On Wednesday we were unpacking our stuff and Morielle called from China! So we stopped unpacking and talked to her and told her all about our trip. Then grandma called and said that Chester and Rona were visiting so we let everything go and visited Chester and Rona. I am very excited about going to their farm in Ekalaka this summer to live and work. Rona said that I can take care of her chickens: give them food and water and collect their eggs. Oh No! Chickens again! Rona showed me her chicken catalog and we talked about chicken coops and different kinds of chickens and eggs. 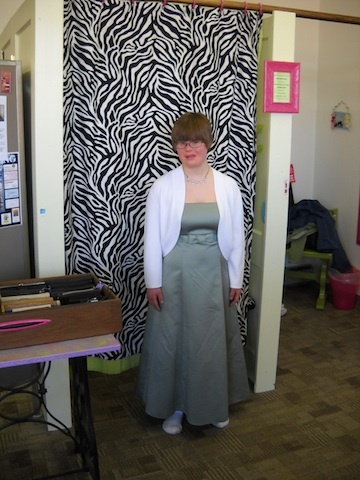 She also asked about my Prom Dress because she had read about it on the blog and wants to see a picture of it. Rona shows me her chicken catalog. Saying `goodbye’ to Chester and Rona. See you this summer! Thursday morning we went lap swimming at the Grizzly Pool and then we went to Joseph’s Coat to spin wool with the Thursday Spinners. 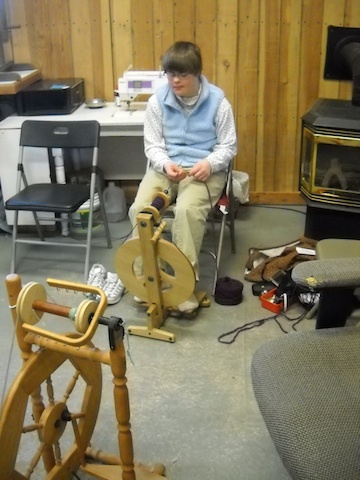 It was really fun to see old friends and spin some yarn. Sharon was there and gave my mom some more ideas for my locker-hooking projects. I guess my Senior Project will never end . . . always something new to learn. My spinning friends were showing different hats that they had made and I got to model them all. It was fun! Spinning with Thursday Spinners at Joseph’s Coat. Friday morning we worked really hard on my Senior Project. It seemed like we were at the computer all morning: typing a lot and then printing and then we would find mistakes so I would type some more and then print again and then check again. The plan was to eat lunch at 12:00 then my mom pushed it to 12:30 and then at 12:30 she said—just one more section, Mathalia—section 5 and then we will stop. Well, okay but this is the last time to delay lunch! In the end I am glad that we pushed ourselves: we made a lot of progress on my Portfolio. It is almost done. It feels good. Then Friday afternoon we took the whole afternoon off: no work for me! I think my mom was finally unpacking and putting away our trip stuff in the basement and in the attic but I was relaxing: I listened to Voyage of the Dawn Treader and I did some locker-hooking which I find very relaxing. Saturday morning it was back to work again–this time it was my Senior Project Presentation. We worked on the PowerPoint, the text, and the photos and I practiced speaking loudly and clearly into the microphone. We had to stop at 12:30 because we had to get ready to volunteer at MCT. They needed my mom to be House Manager and me to usher. So I got to see Alice in Wonderland twice on Saturday afternoon—that was very fun and relaxing. On Sunday after church, I wanted to usher for Alice in Wonderland again AND I wanted to finish listening to Voyage of the Dawn Treader and I wanted to bake a cake to share with friends at school. My mom said I could not do it all so I skipped ushering. It was hard. I was thinking about the Sunday cast and their performance all afternoon. I am sure that they had fun! I got to finish listening to my book and I baked my cake to share with friends on Monday because Monday, April 8 is my 19th Birthday! I am excited! I will celebrate a little with my parents but we will have a bigger celebration with grandma and grandpa and Uncle Jeff later in the week—I told you he can show up at anytime and anyplace just as long as there is an airport nearby. Fun! Fun! Sprinkling the topping on the cake. Putting the cake in the oven. Love those pot holders! So that is what we did after we got home from our trip. Well . . . that’s not all because I practiced my violin every day getting ready for my District Solo and Duet April 19th AND I made sure that we wrote a blog post every day, well almost every day—even when my mom was very tired, I said we gotta write on the Blog, because I kept a journal of our trip and you promised. So we did. This is the last installment of my Spring Break adventures. Tomorrow is the beginning of the countdown: it’s my Birthday AND graduation is June 1st: 18 more Gold Days and 18 more Blue Days and then Big Sky High School will be all done for me. My mom said that things are going to be really really CRAZY and she said that she is glad that we got so much done on my Senior Project during Spring Break because the next few weeks are going to be very fun with lots of end-of-year activities: Senior Project work, Prom, Special Olympics, FFA with a goat and maybe chickens. YIKES! And she said that it is important that we enjoy it all, the craziness, the stress, everything because . . . `the end of the matter is better than its beginning’ Hah! I wonder where she got that quotation :-)! She said that it is important for us at all times and in all places—crazy times, fun times, stressful times, all times—to give thanks, most especially not to forget, not even for a moment . . . to give thanks. I suppose this means that we will be going through lots of kleenex boxes . . . This one is for Rona! Friday night and Saturday morning I swam with my Missoula Aquatic Club friends which was fun. I walked back home and did some chores. I even went downstairs to get the plunger and plunged the toilet when it got backed up. My mom was very proud of me about that but then later when I was just sitting in the car waiting for her, she got a little frustrated with me. She said, `Mathalia, if you want to go to Sugarloaf and spin wool with friends, you have to help pack the car.’ She left me alone and let me think about it. I think she was hoping that I did not want to go because she wanted to stay home BUT I thought about it for a few minutes and then I knew that it really was up to me to take the initiative to pack the car. So I unbuckled my seat belt and went in and got my spinning wheel and the other stuff and packed the car because I wanted to go to Sugarloaf. And we did and it was fun! We arrived at Sugarloaf a little late but we still had a nice lunch with friends and I spun some of my pretty purple wool into yarn. One friend had a pretty neck scarf that my mom thought she could make out of my yarn so she was pretty excited about getting that idea. I was excited to see Jim and Sue’s cat because the cat reminded me about my Creative Writing class. I am writing a story about a cat. I petted the cat and picked her up but she scratched so then I put her on the car next to me. My friends were excited to see me and were very interested in my loom that is in the attic and the rugs that I am weaving. 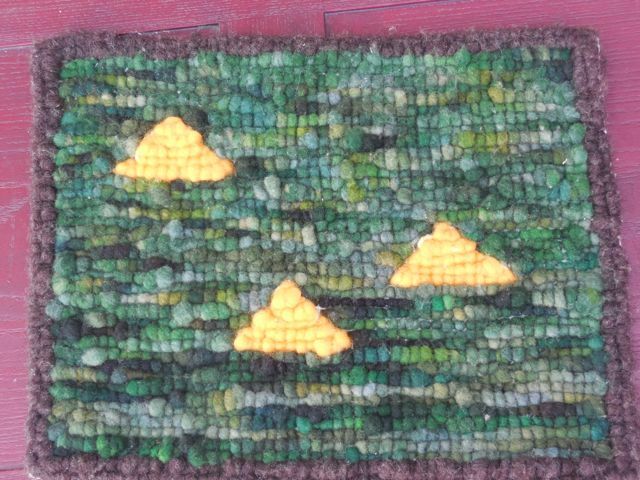 They want me to bring one of my rugs next month to show them my work. They were also excited to learn that I am a Senior: what will you do next year Mathalia? Well, I don’t really know what is going to happen next year but I am `sowing my seed in the morning’ and `not withholding my hand in the evening’ as my mom likes to say. . . . `because you do not know perhaps both alike will be good’ So I guess you could say that my jobs and volunteer work are sowing my seed in the morning and in the evening I am keeping up my pot holder business and learning to make new products because . . . we do not know what the future will bring. Anyway, this question got me thinking about things so on the way home I talked to my mom about my Senior Year and about June 1st graduation. (Click here if you want to read about Graduation Day. )`Senior Year is all done,’ I said. `No, not yet,’ said my mom. `June 1st will be your last day of high school and then on June 2nd you can say that Senior Year is all done and high school is all done. You still have March, April and May to enjoy your Senior Year.’ `Yes,’ I said and then I thought about my Senior Year and my Junior Year and my Sophomore Year and my Freshman Year and then I remembered . . . that I had forgotten to wear my black orchestra clothes on Thursday last week when the Yearbook photographer came in to take our group orchestra picture. Oh dear, I was not wearing black in the picture! While we were driving, I told my mom this story about my forgetting to remember to wear black on Thursday. She said, `It’s okay; it is not the end of the world, at least you were in the picture and you remembered your violin.’ Then I said, ‘I will remember next year.’ And my mom said, `Mathalia, there will be no more next year for orchestra or for high school. High School will be all done on June 1st; we were just talking about that, remember?’ Yes, I remembered. Then she asked me if I thought that was sad. `No,’ I said, `I am happy.’ Bittersweet is what she called it—-whatever that means. When I got home, I pulled out my Junior Year Yearbook and enjoyed looking at the pictures of all my friends and teachers and the fun activities that happened that year in high school and I remembered all my friends who were seniors and who graduated and those I don’t see anymore, like my friend Ally. Perhaps this is what she means when she talks about it being `Bittersweet.’ Anyway, I am having lots of fun this my Senior Year and I am excited about my Senior Year Yearbook. My mom said that I should get it in May sometime. It will be fun because my friends can write me notes in it again. On Sunday grandma made pancakes for us after church. When my dad asked me how many I ate, I said two. My mom thought it was more like 5 or 6. Anyway, it doesn’t matter. They were very good. I played Muggins with my mom and grandpa. My mom won when she `mugginsed’ grandpa and then grandpa went out after that. I was the last one to finish my card but I think it was because they were talking and I got distracted and I wasn’t paying attention and grandpa got to `muggins’ me a lot. It was fun. Then we did the puzzle I got for Christmas: a dog puzzle with golf clubs and golf balls. At home my mom suggested that we take naps since we sprang forward in the morning lost and hour of sleep. Good idea.